The Humboldt Area Center for Harm Reduction (HACHR) took a step toward helping reduce local overdose and infection rates yesterday, as a physician has agreed to carry a prescription for Naloxone and bulk syringes. HACHR would not disclose the name of the physician, but spokesperson Michelle Ellis said they were lucky to find someone who was "really concerned about hepatitis C rates." Humboldt County has the fifth highest infection rate in the state for the disease, which is primarily transmitted through intravenous drug users sharing needles. 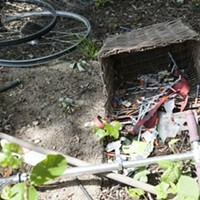 HACHR and other harm reduction proponents have faced opposition to the practice of needle exchange, in which clean needles are given to substance users and dirty needles disposed of. Despite evidence that syringe exchange does not encourage drug abuse and reduces rates of infectious diseases, including HIV, local and federal funding for this harm reduction practice has been restricted. A recent ease in federal funding, included in the December spending bill, may mean more opportunities for local health providers to offer clean needles and access to care. In the meantime, HACHR will train and supply peer counselors to visit substance users and exchange equipment, up to 500 needles a day. With the help of grant funding, HACHR was also able to establish a standing order for Naloxone, an anti-overdose drug that can save the lives of opiate users. Naloxone has been approved for over-the-counter use since April, but most local pharmacies do not carry it, citing training costs as a factor. HACHR argues that the savings of equipping those in the substance using community with the overdose remedy — $10 a dose vs. thousands of dollars in emergency room visits — makes it a practical solution. HACHR plans to train families and friends of substance users in how to administer Naloxone to someone experiencing an overdose, and also hopes to eventually equip local law enforcement officers with the drug. Between 2011 and 2013, Humboldt County's drug-induced deaths were five times the state average.